The Harrington School of Communication and Media is working to give students access to a more broad look at the school’s focuses through a new “integrated media” major. 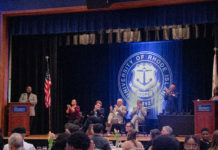 The Harrington School houses the undergraduate communication studies, film/media, journalism, public relations and writing and rhetoric majors at URI and aids with collaboration and integration within the departments. Zorabedian says this new major is a quintessential example of that goal coming to fruition. The major would utilize already existing courses within the school but allow students to combine classes from those different majors into one curriculum. “Really the student would have flexibility to, among a select group of courses, create his or her own major depending on his or her interests,” Zorabedian said. Additionally, students beginning the major will take a new introductory course – a combination of courses like COM 100, FLM 101, and JOR 110 – to give a brief overview, as well as a new capstone course before graduation allowing students to demonstrate everything they have learned. The major will have four learning outcomes, ranging from gathering and evaluating evidence, producing and analyzing media, understanding public discussion and understanding meaning, all directed at creating a well-rounded and more marketable student. “We feel a student coming out will have a good knowledge of all the areas and will have skills to go into careers not just in one [concentrated] approach, but across the curriculum,” Zorabedian said. The idea for the major stems largely from the changing environment of careers in the communication and media worlds, Zorabedian said. According to him, after talking with alumni and employers, graduates with a more diverse communication-skills based background are in higher demand in today’s liberal arts economy. “There’s no area on campus, that I know of, that is changing as rapidly as communication and media,” he said, referring to jobs in the field as “moving targets” some of which do not even exist yet. Rather than restrict a student’s education to one smaller field, the integrated media major hopes to focus on more universal and transferrable skills like writing, producing and thinking critically. The major will also be helpful for students who are not sure which specific sector of communication they want to study in, allowing those students to take a more diverse cross-section of courses then choose which direction they want to head. Zorabedian says he sees it being a popular second-major option, combined with any of the more traditional media majors. “The idea is to distinguish URI with a truly interdisciplinary approach,” Zorabedian said. “What we want to do is offer something that is more relevant and perhaps different from what other schools are doing.” Some universities offer tracks within majors intended at broadening the curriculum, but very few have an entire major similar to what is being proposed at URI. Although it is still early in the process, Zorabedian is hopeful the major will be available, at least, to already enrolled students to switch into or double major in beginning next fall. Previous articleYou are drinking Coke now, did you notice?